12 runners, two vehicles and 200(ish) miles. Each year, the Montana Running Ranchers tackle this journey with a different race in the Ragnar Relay series. 2016’s race took the team to the Hawaiian Islands for a hot and windy race. Despite being short one runner, MRR succeeded and finished in the top 5 percent out of nearly 300 participating teams from across the country. To run 200 miles with 11 runners, is no easy feat. 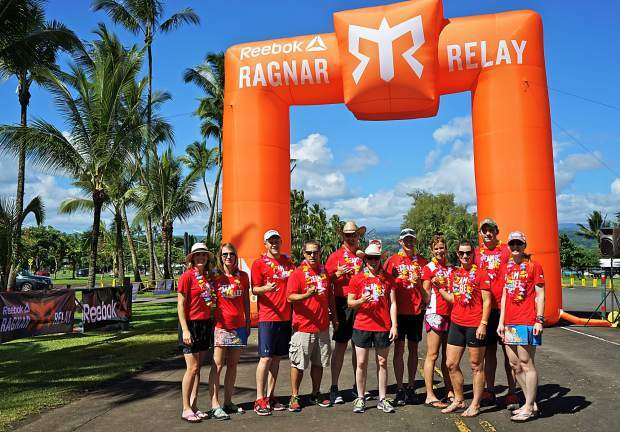 Add in tropical moisture, several thousand feet of elevation climb and mid-day heat over fields of black lava rock, and the Ragnar Relay Hawaii proved to be one of the most challenging races completed in recent years for the Montana Running Ranchers. As usual, the Running Ranchers represented Montana and their ranching communities well. Relay teams from across the country complemented the team’s vehicles (decorated with brands from supporting ranches) and upbeat spirit during the race. Of course, handing out samples of Hi-Country Beef Jerky, aided in bringing smiles to hungry, tired runners throughout the night and into the second day. This year, the team faced a new challenge by starting at the back of the pack. Ragnar Relay staggers runners, with the slowest teams beginning at 5 a.m. and the fastest team starting at noon. The Running Ranchers were awarded a start time of 11:30 a.m., which meant they were bringing up the rear throughout most of the first third of the course. However, overnight, the team made up much time on slower teams as the course moved into steep climbs on the north side of Hawaii. By sunrise, the team was near middle of the pack and passing slower teams on a frequent basis. Nearing the finish line, teams found themselves amidst fields of black lava rock in mid-day heat. With temperatures nearing the low-90s, the guys brought the Montana Running Ranchers to the final miles with a finish time of just over 30 hours to place 16th overall. The journey wasn’t all about escaping early-season snow and running in the tropics for this Montana team. The Ragnar Relays offer a unique opportunity to connect with a few thousand runners and leave positive impressions about beef and ranching. Throughout the journey, several runners approach the team to ask about Team Beef jersey, ranch brands on the vans and inquire about how their food is grown. The ranchers meet vegans, vegetarians and consumers with a variety of diet choices; encounters which almost always are cordial and spark a positive feeling on a sometimes-combative topic. This year’s team left a piece of Montana on the island after meeting a local rancher who asked to display the Team Beef Montana logo on his stock trailer. Something that will surely spark fun conversation on many future occasions. 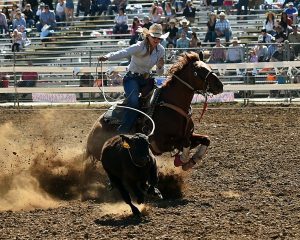 The Montana Running Ranchers team consists primarily of ranchers from across Montana. 2016 runners include: Evelyn Halverson from Big Timber, Heather Fryer from Hobson, Christy Pletan from Harlowton, Sarah Nash from Harlowton, Christy Gerdes from Huntley, Billie Jo Holzer from Moccasin, Dustin Ladenburger from Stratton, Nebraska, Ed Rollins from Ione, Oregon, Robert Majerus from White Sulphur Springs, Ian Morse from Spokane, Washington, and Ryan Goodman from Helena. Many thanks go to area ranches and agriculture business supporting the Montana Running Ranchers and their advocacy work throughout the year. Premiere sponsors include: Gold – Montana Beef Council; Silver – Montana Farmers Union; Bronze – Northwest Farm Credit Services, HFM Foodservice, and Hi-Country Beef Jerky; Qualifier – Western Livestock Reporter, Meagher County CattleWomen, B Bar M Ranch, and Nash Land and Livestock; AgriBusiness – Northern Ag Network, VIP Livestock Marketing, Sunshine Apiary, Pioneer Meats, Lincoln County (NE) Feedyard, Bank of Baker, Reilly Insurance, Bank of Eastern Oregon, Heli-Works Flights Services, and Indreland Angus; Ranch Brands – Earl and Glenna Stucky, Casey Coulter, Martin-Morse Livestock, 3C Cattle Co, LJ Switzer Ranch, Public Auction Yards, Wang Ranch, Bev and Ed Fryer, Castle Mountain Ranch, Gilbert and Julie Majerus, Mike and Debbie Hammond, Thomas Sparks, Chris and Tiffanie Labbe, Suze Bohleen, Ross Hansen Ranch, Bridger Creek Ranches, Mick Goettle, and Billie Jo Holzer. To connect with the Montana Running Ranchers, inquire about joining the team, or submit a sponsorship, visit bit.ly/mtrunningranchers or email mtrunningranchers@gmail.com. Everyone can follow team members’ efforts throughout the year on Facebook by joining the “Montana Running Ranchers/ Team Beef Montana” group.